Many people are calling the man who trained bees to make honey from marijuana a genius. It is something many have talked about doing, but no one has been able to successfully pull it off. At least until now, of course. His name is Nicholas Trainer — nicknamed Nicholas Trainerbees. He is 39-years-old and lives in France. In addition to being a beekeeper, an artist, and a locksmith, he is also an outspoken supporter of marijuana. When Trainer was just 7-years-old, he began to get into a lot of trouble at school because he was hyperactive, which eventually led to him dropping out. However, soon after leaving school, he realized that using cannabis for medical purposes helped him deal with his condition. “I began consuming before the age of 10,” he explained to Dinafem. So, over the last few years, Trainer had been trying to figure out how to combine his love for bees with his love of marijuana. And as you can see, it looks like he figured it out! 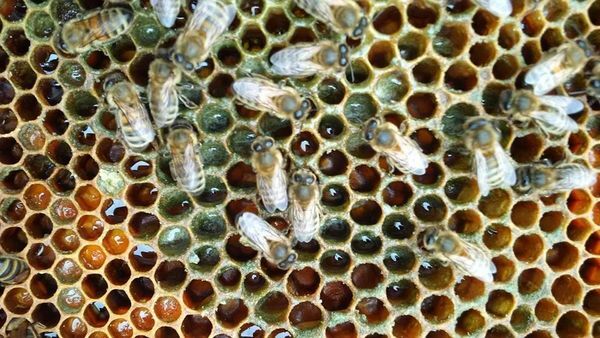 By using what he calls “a training technique whereby the bees collect the resin and use it in the beehive,” Nicholas and his bees, which are solely responsible for the final substance, have created the world’s first batch of cannahoney. Since this is such a new phenomenon, no one has had the chance to test how much of the original cannabis is in the final honey product. However, Trainer believes that cannahoney contains the health benefits of both honey and cannabis. Now, you may be wondering if cannabis is in any way harmful for the bees. The answer is no. “The bees that produce the cannahoney are not affected by cannabinoids because they do not have an endocannabinoid system”, he explained. So don’t worry, the bees are perfectly healthy! “Everything that passes through the body of a bee is improved,” he said. Resin obtained from trees and plants, including cannabis, is turned into propolis, which is an antiseptic, antibiotic, antifungal, and antibacterial. The bees will also use the resin from any strain, meaning there are almost limitless possibilities for creating different kinds of cannahoney. 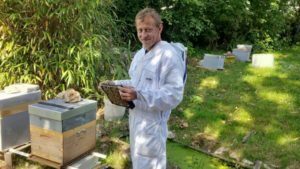 Trainer now has over 30 beehives to create the honey. His cannahoney is everything it claims to be — it could essentially be the first-ever all-natural cannabis edible.